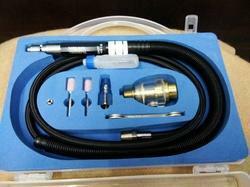 We are a leading Manufacturer of air micro die grinder 3mm kit from Mumbai, India. As a reputed organization, we are aimed at presenting a distinguished array of Air Micro Die Grinder. The offered die grinders are valued due to its optimum quality. Our die grinders are manufactured with finest grade material and leading technology under the direction of our skilled professionals. Our die grinders are provided in numerous specifications to meet the varied needs of the clients.